Like beer and wine, sake ingredients are fermented to produce alcohol. 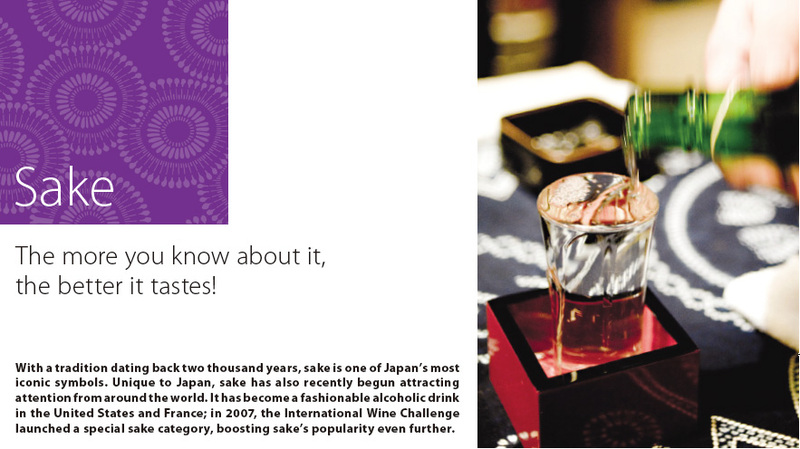 Whether it has been heated up to a piping 55°C, or cooled to 5°C, sake can be enjoyed in a range of temperatures. An excellent companion to food, sake complements any kind of cuisine. For example, with either fish or shellfish, sake tends to amplify the delicious elements of food while neutralising any fishy smells. Unlike many other drinks, it also harmonises nicely with fresh fruit. Sake goes well with soup dishes and blends superbly with soy sauce and miso. The 1,700 sake breweries spread throughout Japan create sake with a variety of different flavours. Sake flavour depends on the quality of the main ingredients: a special type of rice, and water, which constitutes 80 percent of a typical brew. The brewing process itself plays a key role in determining sake flavour. Sake can be broadly divided into the three categories of Ginjo-shu, Honjozo-shu and Junmai-shu, depending on the amount of polishing that the rice has undergone. For example, if the rice is polished to 60%, this means the outer part of the brown rice has been taken off by 40%. Rice polished as close to the core of the grain as possible creates a clear, clean taste. Ginjo-shu sake uses white rice polished to less than 60%, koji yeast, water and brewer’s alcohol and employs the Ginjo method of brewing. It has a fruity aroma and a clean taste. The ingredients of Honjozo-shu sake are white rice polished to less than 70%, koji yeast, water and brewer’s alcohol. It is usually reasonably priced and has an appealing clean flavour. The final category, Junmai-shu sake places no limitations on the degree of rice polishing and is made using only rice, koji yeast and water. Compared to Ginjo-shu and Honjozo-shu, Junmai-shu has a true rice flavour and acidic characteristics. These can then be split up into further categories called: Daiginjo-shu, Junmai daiginjo-shu, Ginjo-shu, Junmai ginjo-shu, Junmai-shu and Honjozo-shu. Each type matches well with different types of food. Essentially, a light and smooth type of sake suits cuisine that is delicate and subtle, whereas a full flavoured sake suits rich, hearty dishes. 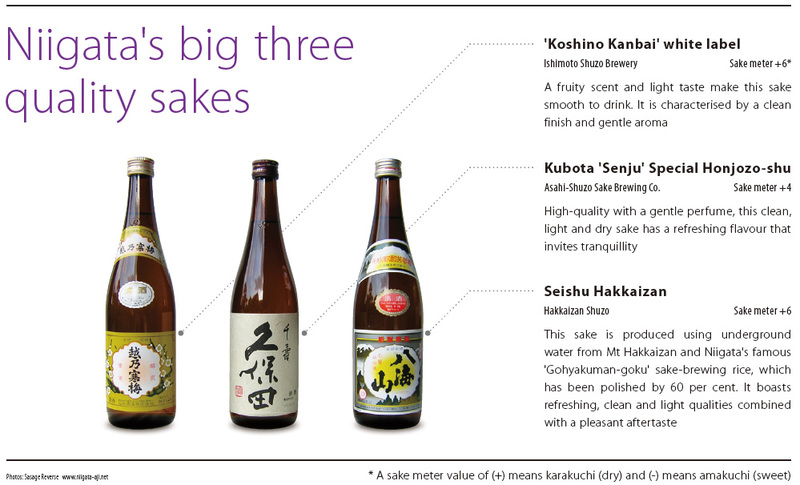 Sake bottles come labelled with a number that shows the Sake Metre Value (SMV). This number gives an indication as to whether the sake is sweet or dry. The lower the number, the sweeter the sake, while a higher number indicates a dry sake with less sugar. Dry sake has a crisp style and sweet sake tastes softer. Should sake be heated or drunk cold? Compared to other types of alcohol, the temperature for drinking sake is varied. In Japanese, the terms hiya (chilled) and okan (heated) are used to describe the two different ways to enjoy sake. So should it be hiya or okan? Sake types that taste better chilled are those with a lovely aroma and clean, clear taste such as Ginjo-shu. But be warned, if chilled too much, the aroma vanishes so the best temperature is between 10°C – 15°C. Full flavoured or acidic sake , like Honjozo-shu, taste better heated. A good way to heat it is to warm the sake bottle in hot water. When sake is heated it becomes sweeter so it’s not recommended to heat more than 35°C. On a chilly winter’s night, nothing tastes as good as a piping hot drink of sake. However, if you enjoy a natural sweet flavour, it is better to keep it to a lukewarm temperature.